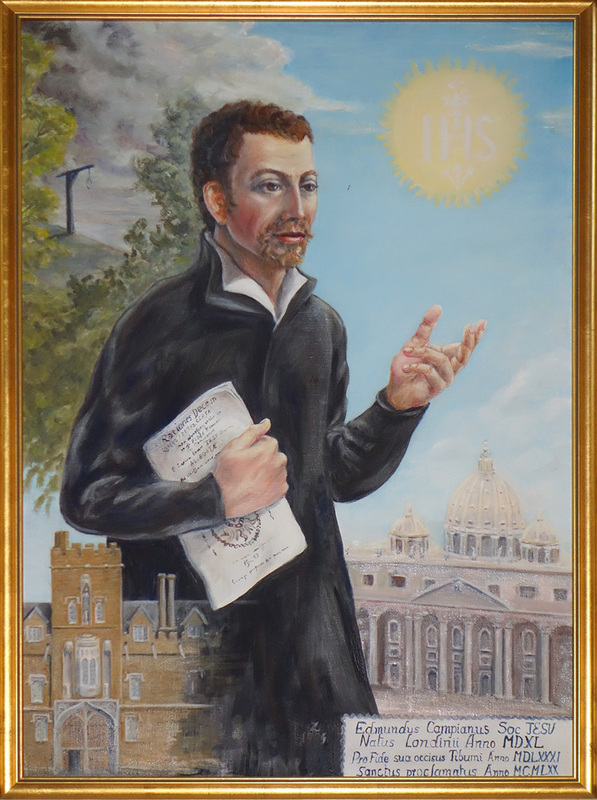 St. Edmund Campion was born in London in 1540, the gifted child of a merchant. He was awarded a grant towards further education and was admitted to St. John's College, Oxford, by its founder Thomas White, where he became an outstanding lecturer in Rhetoric. In 1566, Queen Elizabeth, whilst visiting Oxford, was deeply impressed by a speech Edmund delivered, in Latin, on the subject of Natural Science, and offered him Royal patronage. However, his leanings towards the 'old religion' resulted in his grant being revoked. His College stepped in and awarded him a travelling scholarship, which took him to Dublin, and it was during this time that he wrote the only book of his to be printed in English, 'The History of Ireland'. Events in England linking Catholicism to treason meant that his return to England was brief before he fled to the English College in Douai, a rallying point for Catholic refugees. In 1573 Edmund walked to Rome where he was accepted into the Society of Jesus as a novice. For six years he trained for the priesthood in Prague and celebrated Mass for the first time on September 8th, 1578. The next two years he travelled much and became known for his eloquent preaching and writing, until he was informed that he was to return to England to serve the persecuted faithful. On the night before he left the sanctuary, a Salesian Father wrote this prophetic inscription above his door, 'P. Edmundus Campianus Martyr'. He crossed the Channel disguised as a diamond merchant and made his way to London where he visited Catholics imprisoned for their faith and preached to the faithful. In 1581, the scale of fines imposed on Catholics was £66.13s.4d, a year in prison for hearing Mass and £20 for not attending Protestant Church. A family of four adults could therefore face fines of £15,500 per year. With such a financial burden it was not surprising that Masses were said in secret, with Priests smuggled in through concealed passages. As informers were entitled to one third of the fines recovered, the risk was considerable. It was under these perilous conditions, that St. Edmund Campion travelled through Berkshire, Oxforshire and Northamptonshire, guided from one Catholic house to another, preaching, hearing confession, encouraging and reconciling Catholics. His eloquence ensured that soon it was known that 'Campion the Jesuit' was at large in the shires. The risk of detection was increasing, particularly in London with the new legislation that made anyone reconciled to the Church, as well as the priest involved, guilty of high treason. As Edmund travelled throughout Nottinghamshire, Derbyshire, Yorkshire and Lancashire preaching more openly and to larger audiences he began writing his most famous book, 'Ten Reasons'. East Ham was the original site for the printing press used to print this work, but after the arrest of several of those working with Campion, it was hurriedly moved to Stonor Park, near Henley-on-Thames, where it was concealed in the attic of Dame Cecilia Stonor's family home. Stonor was ideally suited as it nestled in obscurity amid the Thames-side woods, and the river afforded easy access to both Oxford and London. Copies were placed on the benches in the University Church of St. Mary the Virgin, Oxford, where Campion was still remembered, and where it was known that people of influence would be reached. As a result, the price on Campion's life was now higher than ever. At Lyford Grange, near Faringdon in Berkshire, the home of Mrs. Yate whose husband was imprisoned, Edmund Campion insisted on not endangering the household further by staying to preach, as they were already harbouring nuns and two priests. After staying one night and celebrating Mass, he left early next morning for Oxford. However, word leaked out that Edmund had not stayed to preach to the local community and a messenger was sent to ask him to return. Campion agreed. That Sunday he preached to sixty people, including a government spy, George Eliot. After Mass, Eliot returned with a squadron of soldiers, and after a search lasting until the next day, they captured Edmund Campion concealed in a priesthole. He was led towards London, stopping in Henley on that first night in captivity. The crowds openly sympathised with him and jeered his captor, Eliot. Campion remained cheerful throughout his arduous journey to the Tower of London. Initially he was treated well, as it was hoped he would embrace the Anglican Church. However, when he refused, despite being offered wealth and power, he was removed to the White Tower and tortured on the rack. He was not persuaded to jeopardise the lives of companions or those who had given him refuge, and two weeks later, he was further put to the rack. Rumours of his betrayal were spread in an effort to discredit him, but he nevertheless refused to speak, even though he was tortured once more two weeks prior to his trial in Westminster. Not surprisingly, he was found guilty of treason and sentenced to be hung, drawn and quartered. On December 1st, he was prepared for martyrdom. He was dragged through the rain along the muddy London roads to Tyburn where a large crowd had gathered, his final speech being drowned out by the throng. He thanked the Anglican clergyman, but refused his ministrations. He forgave the jury who had condemned him and begged the forgiveness of those he may have compromised. It was still early on that wet December morning when St. Edmund Campion's life ended in gruesome martyrdom, aged 41 years.